Every 1911 owner and gun shop needs a wrench to remove the barrel bushing from the 1911 Autos. Ours fits all the calibers and variations; Colt-made (including factory Officers ACP), plus copies. Made from super tough ABS "T" grade polymers, Brownells Can't Mar™ wrench has more thickness and heft than other synthetic wrenches. It gets out even the most tightly fitted, match-grade bushing WITHOUT scarring or marring the finish of the gun's bushing or slide. Virtually unbreakable, the Can't Mar™ wrench carries easily in pocket or field kit. SPECS: 5½" (14.0cm) long. 1¼" (3.2cm) wide. .187" (4.75mm) thick. Weighs 1 oz. (28.3gm). Hver 1911 eier og pistol butikken må en fastnøkkel til å fjerne fat foringen fra 1911 biler. Vår passer alle kalibre og variasjoner; Colt-laget (inkludert factory offiserer ACP), pluss kopierer. Laget av super tøffe ABS "T" klasse polymerer, Brownells ikke Mar ™ har fastnøkkel mer tykkelse og heft enn andre syntetiske skiftenøkler. Blir det ut selv de mest tett montert, kampen-grade foring uten arrdannelse eller marring fullføringen av pistolen foringen eller lysbilde. Nesten uknuselige, den ikke Mar ™ fastnøkkel bærer lett i lommen eller kit. Spesifikasjoner: 5½-"(14.0 cm) lang 1¼" (3.2 cm) bred. . 187"(4,75 mm) tykk. Veier 1 oz. (28,3 gm). I bought one of these for my Colt Officers ACP. The wrench plastic just deformed on the first use, didn't remove the bushing, and was useless from then on. The bushing is fairly snug on my .45 so maybe that's why it didn't work. Good idea but did not work for me. A waste of my [$] and not worth the cost of returning. It worked splendidly a handful of times. After a couple of uses it starts to get seriously chewed up and malformed, leaving bits of orange plastic all down in the guide rod area of the gun. After about 10 uses it was so chewed up it would not successfully break down the gun. I like this plastic tool better than the Brownells steel Colt wrench because it is light and scratch proof. It does mar slightly because it is plastic. Unless you have super tight bushings, it works perfectly. If you have super tight bushings, you may need the aluminum bushing wrench. Works great, will not mar finish and holds up Great. have used one in my shop for years and have taken down 100's of 1911's with it, from time to time I have run across a gun with a spring cap, bushing or a slide that has a bur and it can leave a mark on it but that is not the fault of the tool. and if the tool where to brake they are so inexpensive that I would not hesitate to purchase a replacement. This bushing wrench is a real finish saver.. after struggling with an SA Pro bushing, can't imagine what damage may have resulted without it. Although it does shed a little plastic and seems somewhat consumable.. it's well worth every penny compared to refinishing. The good thing about this plastic wrench is that it doesn't mar the finish, and of course, you probably won't misplace it. If you have a tight, accurized bushing, as I do, it won't last more than a few times before it gets chewed up. But for the price, buy a few of them. This tool does what it says but is a little on the soft side for tight bushings. I tore mine up pretty good when fitting a Wilson Combat bushing into my wife's Colt Officers model 1911. The wilson bushing is very tight fitting(good, good,good) after fitting for accuracy. I've recently up graded to the aluminum version. It is a very good Bushing Wrench, as it will not mark up your 1911. I would strongly reccomend the purchasing of a few of them for working on or cleaning your 1911. I purchased 2 wrenches but found the tolerances are sloppy for a standard 1911 A1 recoil bushing. Trying to make it fit caused the wrench to slip and the recoil spring plug to go flying off the workbench. Cost to replace the plug plus freight about $16. Recommend to step up to the metal wrench. Does what it says and doesn't mar the finish on the gun. Only drawback is the plastic is a bit on the soft side so it wears out pretty quick. Works great but wish it would last a bit longer. Fits both style of bushings. Can easily be reshaped for a custom bushing. Light weight, Strong. Mine has lasted for years. buying a new one cause the old one is among the missing!!!! Wears out very fast if you have a tight fitting bushing, this won't last long at all. Material is very soft and won't mar the gun but won't last long at all. On the first use, lots of mat'l chipped away from the tool. I imagine after about three uses it would be junk. Also, so soft that it flexes so much that you can hardly hold the spring plug down enough to turn the bushing enough to lock back in place but it doesn't scratch your weapon at all. 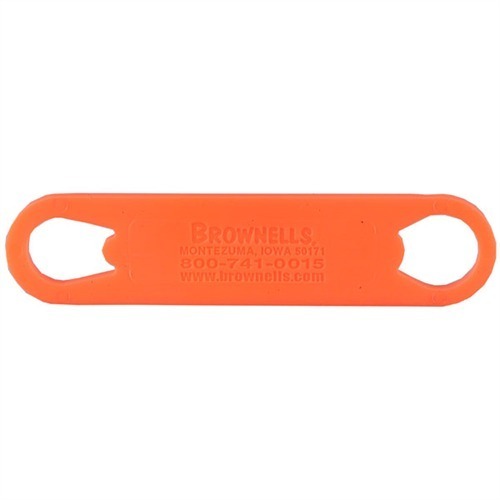 I have now got the brownells enhanced bushing wrench with the flange that retains the recoil spring plug as you twist the bushing free, Great tool and won't scratch your weapon as it is made of aluminum. Well worth the extra money, remember you get what you pay for. The openings are too small (short) to fit my Springfield Armory Inc. target model. Also, to material is too soft, it peels off if I force it onto the bushing. Not worth the money. Produsentnr. : 080045045 050806102200 Hver 1911 eier og pistol butikken må en fastnøkkel til å fjerne fat foringen fra 1911 biler. Vår passer alle kalibre og variasjoner; Colt-laget (inkludert factory offiserer ACP), pluss kopierer. Laget av super tøffe ABS "T" klasse polymerer, Brownells ikke Mar ™ har fastnøkkel mer tykkelse og heft enn andre syntetiske skiftenøkler. Blir det ut selv de mest tett montert, kampen-grade foring uten arrdannelse eller marring fullføringen av pistolen foringen eller lysbilde. Nesten uknuselige, den ikke Mar ™ fastnøkkel bærer lett i lommen eller kit.